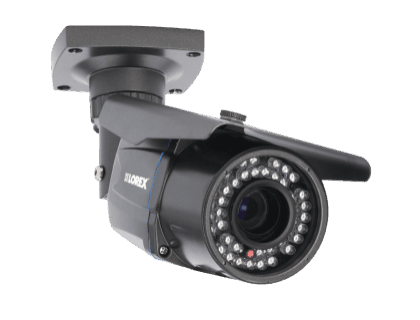 Learn more about the Lorex Outdoor Security Camera with Varifocal Lens. Includes prices, features, and frequently asked questions. The Lorex Outdoor Security Camera with Varifocal Lens is an indoor/outdoor camera from Lorex. The varifocal lens in the camera allows you to zoom for more detailed video recording. 165 ft. night vision range. Versatile adjustable 33-104° field of view. Pros: Vandal resistant housing. Sharp image quality. Cons: Can only see up to 110 ft. in total darkness. Bottomline: A reliable Lorex security camera with a variety of convenient features to enhance security on your property. What are some alternatives to the Lorex Outdoor Security Camera with Varifocal Lens? SANSCO Security Camera System with 8-Channel 1080N DVR. Safevant 8CH 1080P NVR Wireless. Zmodo Smart Wireless Security Cameras. Firstrend 8CH Wireless NVR System With 4pcs. Where can I buy the Lorex Outdoor Security Camera with Varifocal Lens? The Lorex Outdoor Security Camera with Varifocal Lens is available on Amazon and on the Lorex website. Does the Lorex Outdoor Security Camera work at night? Yes, this particular camera is equipped with night vision that has a maximum range of 165ft. in ambient lighting. Can the Lorex Outdoor Security Camera with Varifocal Lens be used in any weather? The camera has an IP66 weather rating, meaning that it is safe to use in any weather conditions - including snow, rain, and high winds.